WinStar Farm, China Horse Club, Head of Plains Partners and Starlight Racing’s undefeated Kentucky Derby Presented by Woodford Reserve (Grade I) and Preakness Stakes (GI) winner Justify returned to Churchill Downs on Sunday at 2:15 p.m. (all times Eastern) to begin training for the third jewel in racing’s Triple Crown, the June 9 Belmont Stakes (GI). “It was a very smooth trip back to Kentucky,” Hall of Fame trainer Bob Baffert’s assistant Jimmy Barnes said. “We had a great trip to Pimlico. We brought two horses and they both won. The only thing that wasn’t so great was the weather. It rained every day we were there – Wednesday, Thursday, Friday and obviously Saturday. “We knew Justify liked the off track in the Derby but Pimlico’s track was different than Churchill. It was more of a harder surface underneath the water. We couldn’t see anything that happened in the race besides the start and finish because of the fog. The colt will walk the shedrow of Barn 33 at Churchill Downs three or four days before resuming light training, according to Barnes. 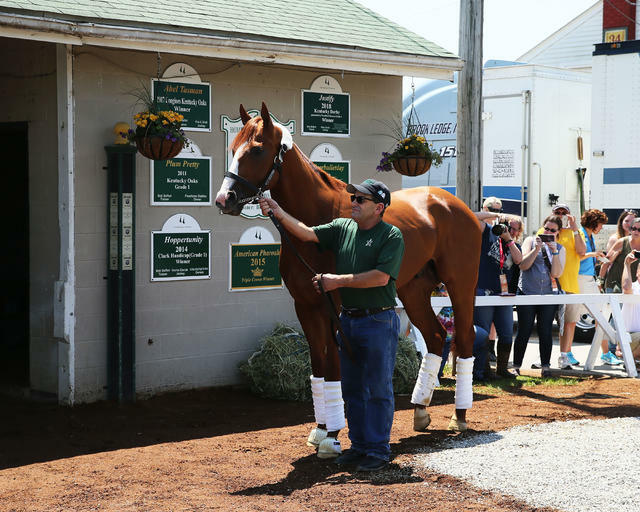 There will be a special training period at Churchill Downs for horses preparing for the Belmont Stakes beginning Wednesday from 7:30 a.m. to 7:40 a.m. Other known possible Belmont Stakes starters based at Churchill Downs include Bravazo, Free Drop Billy and Tenfold. STAVE POSSIBLE FOR GRADE III REGRET FOLLOWING SATURDAY’S ALLOWANCE WIN – Hinkle Farms’ two-time winning homebred Stave could target the June 16 Regret Stakes (GIII) at Churchill Downs after her 1 ½-length front-running score in a first-level allowance Saturday beneath the Twin Spires, according to trainer Larry Jones’ Churchill Downs-based assistant Corey York. Ridden by Gabriel Saez, who notched four wins on Saturday’s card, Stave rallied from just off the early pace to draw away in the late stages in a final time of 1:51.41 for 1 1/8 miles on the turf. Buy the Barrel was a seven-time winner for Hinkel Farm and Jones. Most notably the mare won the Allaire DuPont Distaff Stakes (GII) at Pimlico with Saez aboard. The Regret, run at 1 1/8 miles on the Matt Winn Turf Course, is one of five stakes run on the June 16 Downs After Dark Presented by Budweiser program. Along with the Regret, the night features four other graded stakes races: $500,000 Stephen Foster Handicap (GI), $200,000 Fleur de Lis Handicap (GII), $200,000 Wise Dan (GII) and $100,000 Matt Winn (GIII). 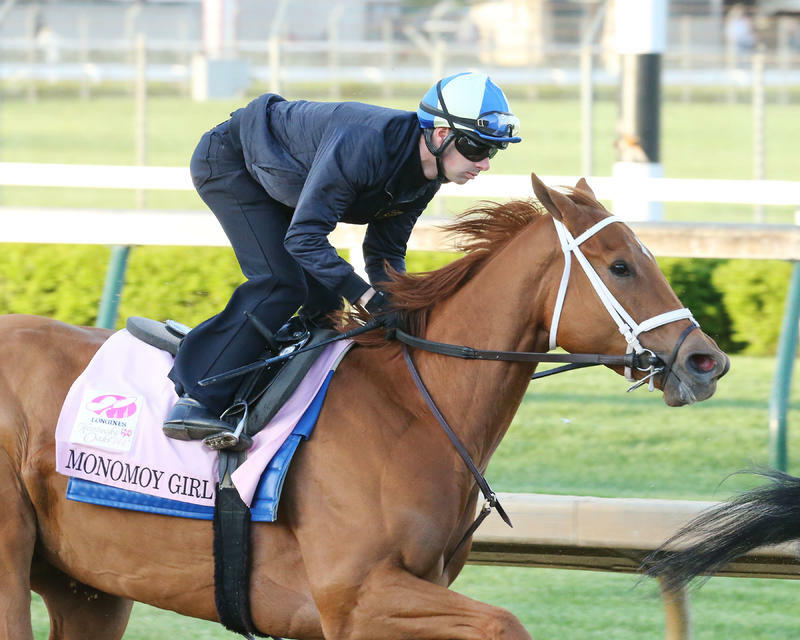 WORK TAB – There were 110 horses on Sunday’s work tab at Churchill Downs led by Longines Kentucky Oaks (GI) winner Monomoy Girl, who breezed a half-mile in :48.80. “She worked awesome,” trainer Brad Cox said. The filly is targeting the June 9 Acorn (GI) at Belmont Park. … Churchill Downs Stakes (GII) third Awesome Slew worked four furlongs in :47 for trainer Mark Casse. … Impressive William Walker Stakes winner Beckford (GB) worked four furlongs in :48.80 inside stablemate Saham (:49.20) on the turf for trainer Brendan Walsh. Beckford is probable for the Commonwealth Cup (GI) on June 22 at Royal Ascot. 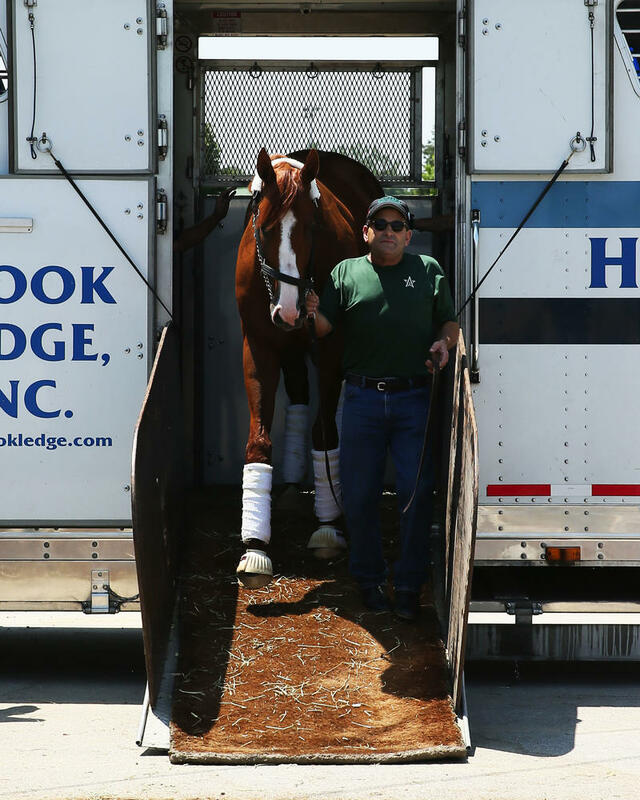 … Bucchero, probable the King’s Stand Island Stakes (GI) on June 19 at Royal Ascot for trainer Tim Glyshaw, breezed four furlongs in :51 on the turf. … Impressive allowance winner King Zachary breezed a half-mile in :47.80 for Churchill Downs’ all-time leading trainer Dale Romans. … Allowance winner Miss Kentucky breezed four furlongs in :48 for trainer Rusty Arnold II in preparation for Saturday’s $100,000 Winning Colors Stakes (GIII) at Churchill Downs. … La Troienne (GI) winner Salty worked a half-mile in :48.80 for Casse. … Clark Handicap (GI) winner Seeking the Soul, who has been on a layoff since running fifth in the Jan. 27 Pegasus World Cup (GI), breezed three furlongs in :37 for trainer Dallas Stewart. … Twin Spires Turf Sprint (GIII) winner Will Call breezed a half-mile in :50.20 on the turf for Cox. 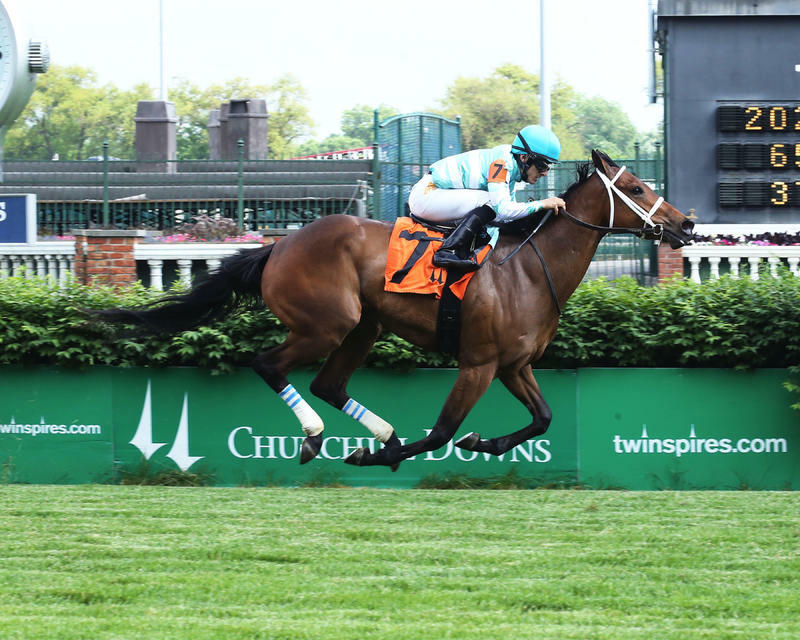 STAKES PROBABLES – Saturday’s 11-race program at Churchill Downs features the 15th running of the $100,000 Winning Colors (GIII) and the sixth running of the $70,000-added Keertana Overnight Stakes. Both races will be drawn Wednesday. Winning Colors probable entrants, according to Churchill Downs stakes coordinator Dan Bork: Brave Daisey (trainer Tina Rena Hurley), Golden Mischief (Brad Cox), Miss Kentucky (Rusty Arnold II) and Treble (Ron Moquett). DOWN THE STRETCH – Churchill Downs begins a five-day racing week starting Thursday with a first post of 5 p.m. for Twilight Thursday. The evening features eight races, live music and local food trucks. Racing will continue through Memorial Day Monday with first posts of 12:45 p.m. For more information and to purchase tickets visit www.churchilldowns.com.